The best way to achieve a smooth, glowing, youthful complexion is by scheduling regular skin therapy. At AMAE Med Spa our complete array of facial treatments are luxurious, relaxing and rejuvenating – pampering you and your skin. Under the supervision of Board Certified Plastic Surgeon Dr. M. Azhar Ali, we offer the most innovative and effective facial treatments for women, men and teens. We will customize a skincare plan for your unique needs – treating everything from acne or scarring to dullness, age spots, and fine lines. Look younger, healthier and more beautiful with our state-of-the-art facial procedures. This exclusive facial is carefully customized for a deep and luxurious cleansing. Followed with a revitalizing exfoliation, extractions and finishing masks. Your complexion will be nourished and refreshed! Treatment of the neck & décolletage is included and a restful hand massage to hydrate, relax & rejuvenate. 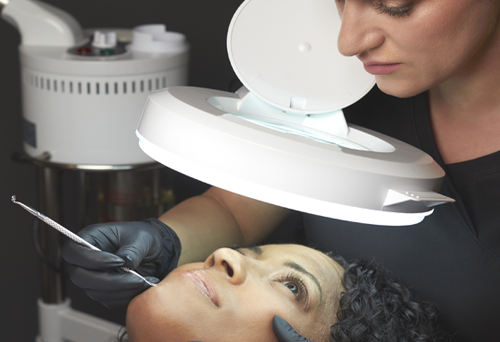 The Image Express Facial targets both a busy schedule and the need to be pampered. This relaxing cleanse, exfoliation and hydration session includes a delicate facial massage. A thirty minute tension reliever offering a youthful glow, renewed spirit, and rested appearance. Because no one should be left out of a therapeutic & relaxing skin treatment! This nourishing & revitalizing facial will awaken the skin care desires of every man. For optimal results, clean shaven skin is recommended. This dynamic therapy facial combines multiple lightning agents with concentrated retinol to lighten the appearance of discoloration and soften the appearance of fine lines and wrinkles. Introducing your skin to the Jan Marini Skin Research award-winning brightening products, while cleansing, exfoliating & hydrating, will leave your skin refreshed, revitalized, and glowing. Looking for more luminous skin? This age transformation therapy from the exclusive line of Jan Marini skin research will help to lift, firm, and tighten the appearance of facial contour using the C-esta facial products. An exceptional anti-oxidant cocktail featuring Vitamin-C, DMAE, and patent growth factor to reduce the appearance of aging and damaged skin is applied. Combined with a deep cleanse, exfoliation, customized mask and facial massage, a younger and healthier appearing complexion will be achieved. Recommended for skin types that have acne or are acne prone. This deep pore cleanse facial begins with the ZO skin therapy to gently remove dead skin cells without harming sensitive or irritated tissues. In combination with medical grade acne products and extractions as needed, the skin is left soothed, refreshed, and bacteria free. This accelerated facial therapy features the highest concentration of retinol. While visibly improving the appearance of fine lines and wrinkles, acne and sun damage, your face will be radiantly hydrated, and flawlessly clean. This award – winning product system leaves healthier, more youthful skin. Specifically targeting the hard to reach skin on the back, this treatment will leave the skin refreshed after an invigorating cleanse, exfoliation, and hydrating mask with extractions as needed. Enjoy a comforting and relaxing massage, and feel rejuvenated. Lip rejuvenation is available to soothe chapped lips and gently exfoliate the peri-oral area that is more prone to fine lines. Completed with a hydrating and plumping lip treatment balm to reveal soft, beautiful lips. This customized eye treatment will address your overall eye concerns. Targeting thinning skin, pigmentation, puffy eyelids or dehydrated skin, this experience will help lift, tone and brighten this delicate area. Décolletage Treatment is an excellent add-on enhancement to any facial, for a more youthful appearance. This area will be gently cleansed, exfoliated, hydrated and brightened, for a more beautiful you.